Clever Ways to Use Dryer Sheets- Dryer Sheet Hacks. It’s amazing how many different ways everyday items can be used! For example, dryer sheets (AKA fabric softener sheets), have lots of other uses than just keeping your laundry soft and static-free! And you can save money by using dryer sheets in place of some other products! Here are some Handy Uses for Dryer Sheets! I always think it’s fun to save money by using one item in place of another. It kind of feels like you’re privy to some sort of secret technique! But remember, all of the dryer sheet hacks below refer to using conventional dryer sheets. All-natural dryer sheets or homemade dryer sheets may not work the same. Because conventional dryer sheets are full of toxic chemicals, we use a combo of homemade dryer sheets and DIY wool dryer balls for laundry in my house, but I do keep a small pack of conventional dryer sheets on hand, just so I can do some of these hacks. If you have a pet and their hair is everywhere, pick up a dryer sheet and wipe it over areas where you see fur. It’ll pick it up easily! According to Real Simple you can keep your thread from tangling by running your threaded needle through a dryer sheet before you start stitching. Did you know that one of the surprising uses for dryer sheets is as a tool to clean chrome surfaces like faucets (or even chrome hubcaps). 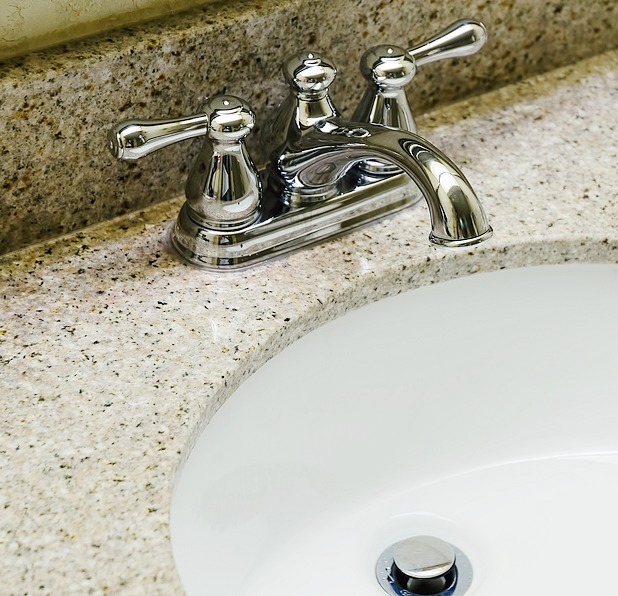 Just buff your faucets with a dryer sheet and watch water and soap spots disappear! Bugs are also deterred by dryer sheets! Place the sheets anywhere that you see insects, especially spiders. Consider cutting the sheets into smaller pieces to make shoving them into corners easier. Just make sure your pets can’t get at the pieces, as they can be toxic to dogs and cats. If you’re planning on putting something in storage, you may want to take advantage of another one of the many handy uses for dryer sheets- as a freshener! Put a sheet into any box or bag you’re planning to store. This can help keep your things (especially clothes and books) from smelling musty after being in storage. In a similar way that they help keep storage smelling fine, dryer sheets can also help remove already existing smells. Consider putting them in your trash cans, diaper bags, or gym bags. Anyplace that normally is a little smelly. I love this dryer sheet hack! Why pay for special dusting cloths when you can just use dryer sheets? One of the many uses for dryer sheets is as a dusting cloth to dust furniture, your TV, ceiling fans, lamps, and more! Isn’t it annoying when you get a deodorant stain on your clothes? Luckily rubbing at the spot with a dryer sheet can help remove the offending mark! There are so many handy uses for dryer sheets! Here’s another clever one- if dirt is always falling out of the drainage holes in your plants’ pots, consider putting a dryer sheet inside the pot at the bottom. This will help keep the dirt in the pot. Only do this for ornamental plants, not anything you would eat, even if you use natural dryer sheets. Also, use dryer sheets that have already been used a time or two- there’s no need to use a brand new one just to block the holes. Though if your potted plant is being plagued by bugs, as mentioned in #5, fresh dryer sheets can help keep some bugs away. When you discover your kids have gotten crayon marks on the wall, don’t panic. Instead, you can just use a wet dry dryer sheet and rub the mark off the wall. Be careful as dryer sheets can be abrasive and remove the paint from your wall (especially if your wall is painted with flat paint). See Families.com for more info. If you didn’t clean your paint brushes as quickly or as thoroughly as you should have, don’t worry. Dryer sheets can help with that, too! Liquid fabric softener also works really well for this. But according to Lifehacker, dryer sheets are also very effective! Just soak the brushes in a cup or two of warm water with a dryer sheet in it. In a few minutes, the paint should loosen up and you can rinse your brushes clean! 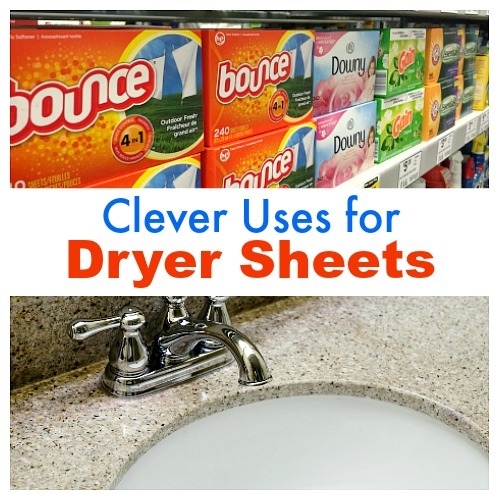 Isn’t it amazing how many clever uses for dryer sheets are out there? And they’re all so frugal! Do you have a creative tip for how to use dryer sheets besides in the dryer? Leave your tip in the comment section below! Smelly books – I love old books, so I use this tip a lot. I cut a dryer sheet in a few pieces and place a piece every 50 pages or so. Leave them for a few weeks, and most of the musty, moldy, cigarette, dusty smells are gone. Have a pan or kettle that has stubborn food spots stuck on? Fill container with water and toss in a bounce sheet. Let set till the notion to clean it strikes! Dump out water and add warer n detergent, begin wiping clean. Voila’ your pot should be free of stuck on food! I actually stopped using dryer sheets to dry clothes and now I have a whole bunch to use up. I’ll have to try some of these things out. My shower doors really need a good scrubbing! LOL! Thanks so much for posting this at the Wonderful Wednesday Blog Hop! Rub a dryer sheet on the inside of any piece of clothing that has static holding it up, and it will make all of the static go away. I have also rubbed a sheet on my hands to get the static out of my hair. Fabric softeners and DryerSheets are highly toxic , especially when heated and a major cause of allergies and ashma in children. young children, putting profits over health. Wonderful tips and information! I love the comment about the old books! Going to try that one! After I use them I tear them in half and use them to easily grab and clean the dryer filter. I use an empty square tissue box to put them in. Works for me.